I bring you, in no particular order, the Seven Wonders of Japan. Kiyomizu-dera is a Tendi Buddhist temple in Kyoto and is one of the oldest and best-known temples in a historic city filled with temples. The current building was built in 1633 by the third Tokugawa shogun and temples on the location date back to 798. Situated on Mount Otowa, Kiyomizu offers a stunning view of the surrounding area. Kiyomizu gets its name from a nearby 13m waterfall. People would often jump off the temple into the water below (a practice which is now banned). “Jumping from Kiyomizu Temple” has become a saying in Japan for doing something daring. Himeji Castle (Himeji-jo) is one of the best-preserved castles in Japan. Construction originally started in 1331, Himeji was untouched by the devastation in WWII, unlike Osaka and Hiroshima Castles. 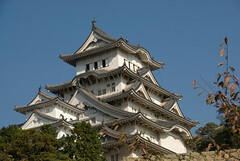 Himeji is considered one of the three great castles of Japan, along with Matsumoto Castle and Kumamoto Castle. Castle holds a commanding view of all the surrounding flat land area, which made it ideal for a military fortification. In addition to its large keep and thick walls, the paths inside the compounds are a maze designed to confuse potential attackers. Himeji can be visited via a day trip from Kyoto or Hiroshima via the Shinkansen, and the castle is within walking distance from the train station. On August 6, 1945, Hiroshima, Japan became the first city ever to be destroyed with an atomic bomb. 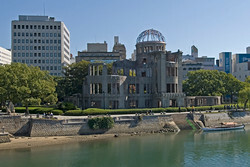 As Hiroshima rebuilt after the war, a decision was made to keep the ruins of the Genbaku Dome (A-Bomb Dome) standing as a reminder of the devastation, and the centerpiece of the Hiroshima Peace Park. The dome and the area of the park was ground zero for the blast which killed over 100,000 people. The park draws visitors from all over the world who come, not only to remember those killed in the war but to hope for future peace. In addition to the A-Bomb Dome, there are memorials to the children killed in the explosions, a peace library, and museum, an eternal peace flame, as well as several acres of park area. Visitors should take the time to ring the Peace Bell. 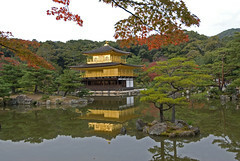 The Golden Pavilion (Kinkakuji) is one of the most beautiful buildings in Japan. Built on the grounds of the Shogun Ashikaga Yoshimitsu in 1397, the pavilion was created to hold relics of the Buddha. The top two floors of the building is coated in gold leaf, which is where it gets its distinctive name. The pavilion was burned down in 1950 by a deranged monk and rebuilt in 1955. The pavilion and the surrounding pond and garden are one of the most photographed scenes in Japan. No trip to Japan would be complete without taking a trip on the Japanese bullet train, the Shinkansen. 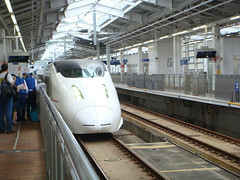 The Shinkansen is the heart of the extensive Japanese rail system. While most of the trains in Japan are normal trains, the Shinkansen are kept on a separate rails designed for rapid transit. The Shinkansen can achieve a top speed of 300kph (180mph). There are no road or rail crossing on Shinkansen tracks. The speed of the train would make an accident devastating. High-speed Shinkansen trains can be taken from Kagoshima in the far south to Hachinohe in the north, covering most of the country. Could any list of the Seven Wonders of Japan be complete without Mount Fuji? Mount Fuji is not only the highest point in Japan but is a symbol of the country which has been used in countless pieces of artwork. Fuji is an active stratovolcano but has not erupted since 1707. Approximately 200,000 people climb Mount Fuji each year, and visiting Mount Fuji is a popular destination for tourists. On a clear day, the summit of Mount Fuji can be seen from Tokyo. 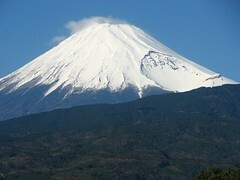 The most popular months for climbing Fuji are July and August. Visiting the base of Mount Fuji can be easily done on a day trip from Tokyo. Japanese cuisine ranks among the best in the world. While sushi often gets the attention, one of the staple foods of Japan is ramen. Originally a Chinese dish, ramen first became popular in Japan during the Meiji period in the 19th Century. Japanese ramen is a far cry from the instant noodles which many westerners think of when they hear ramen. Ramen was believe to have been brought to Japan by Chinese merchants in Fukuoka. Fukuoka ramen is known for its rich, pork based Tonkotsu ramen, topped with a pork cutlet. The Golden Pavilion was one of the most beautiful attractions I’ve ever seen in my entire life… parts of it are actually made from gold. Oh, and beautiful Koi fish were swimming in that lake around it! Nice photos. I took a business trip to Kyoto 2 years ago, and it was just amazing. Thank you, Gary, great! I’m live in japan.I like your website very much. That’s really awesome!! Beautiful photos and great writeup! I’ve recently been to Japan and had Japanese ramen… Simply amazing! =) It definitely deserves to be on this list. Here are a few more I came accross, hope you enjoy them! I have visited the japan last month & spend total one month in Tokioyo. Apart from the above list of wonders there are many more things to visit like in Tokioyo only ASAKUSA the olden days city shows the ancient days of Japan. Ichikanagawa one of place in lTokiyo famous for Aisa’s biggest China town, in Yokohama the yokohama Marine tower and many more. One must visit Japan once in a life. I would say that your photography skills have come a long way. By the way, I’m curious as to what kind of camera you use? Great pics. Well done, Gary. I came across you via twitter tonight (my first go at twitter). I’m impressed by your writing skill and style. 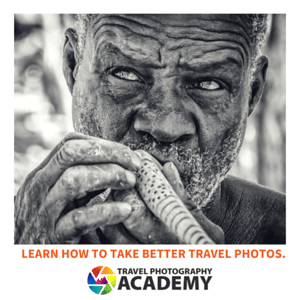 Travel is my passion also and being retired from the airlines (and the Marine Corps), I have the resources and time to feed my passion. Hi Gary, very good list.. I’m only missing the Itsukushima Shrine on the island of Miyajima. Dang, it seems the top temple in Kyoto and I guess your first wonder is one of the few temples in Kyoto that I didn’t see. I guess that leave something for next time. Great list of items, haven’t been to Fukuoka, and the Japanese cuisine all around is just fantastic. it wasn’t until going to Japan did I realize how diverse of a cuisine it is. Very cool, a couple of these sites are new to me, but I love that you included Ramen!! p.s. have been a reader for ages and finally added you in blog roll. Great post. Really well written, all-around informative post. Thanks. Great read Gary, nicely written up indeed.